The following is taken from the biography of George Whitefield, Volume 1, by Arnold Dallimore. We learn from this account how eager and how excited these early settlers were to hear the Word of God. Would that it were like that today! Now it pleased God to send Mr. Whitefield into this land and we longed to see and hear him ... and then one morning all of a sudden there came a messenger and said, "Mr. Whitefield ... is to preach at Middletown this morning at 10 o’clock." I was in my field at work. I dropped my tool that I had in my hand and I ran home and into my house and bade my wife to get ready quickly to go and hear Mr. Whitefield preach at Middletown and ran to my pasture for my horse with all my might, fearing I should be too late to hear him. I took up my wife and went forward as fast as I thought the horse could bear and when my horse began to be out of breath I would get down and put my wife on the saddle and bid her ride as fast as she could and not stop or slack for me except I bade her. And so I would run until I was almost out of breath and then mount my horse again ... fearing we should be too late to hear the sermon for we had twelve miles to ride in little more than an hour. I saw before me a cloud or fog. 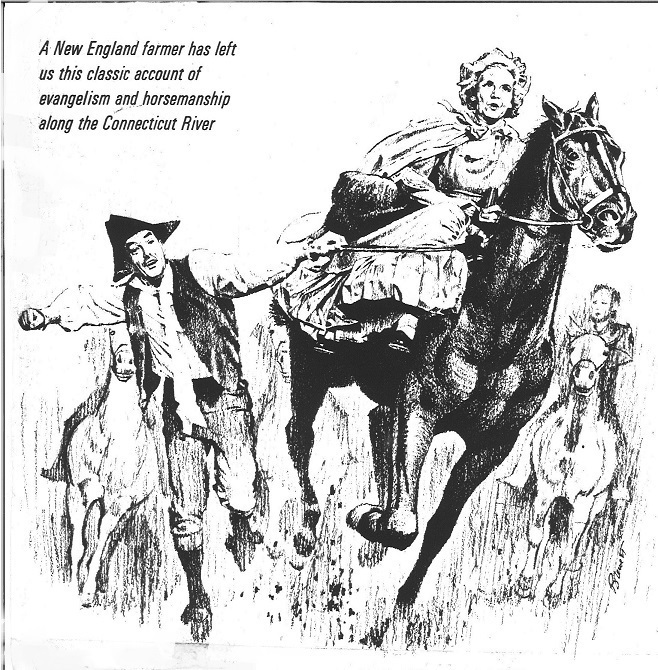 I first thought it was from the great river [Connecticut River] but as I came nearer to the road I heard a noise, something like low rumbling thunder and I presently found out it was the rumbling of horses' feet coming down the road. And this cloud was a cloud of dust made by the running of horses feet. It arose some rods into the air over the tops of the hills and trees and when I came, within about twenty rods of the road, I could see men and horses slipping along. It was like a steady stream of horses and their riders scarcely a horse more than his length behind another. I found a space between two horses to slip in my horse and my wife said that our clothes will be all spoiled--see how they look. And when we got down to the old meeting house there was a great multitude. It was said to be 3 or 4 thousand and when I looked towards the great river I could see ferry boats running swift forward and backward. When I saw Mr. Whitefield come up upon the scaffold he looked almost angelic--a young slim slender youth before thousands of people and with a bold undaunted countenance. And my hearing about how God was with him everywhere he went solemnized my mind and put me in a trembling fear before he began to preach. For he looked as if he was clothed with authority from the great God and a sweet solemnity sat upon his brow. My hearing him preach gave me a heart wound and by God's blessing my old foundation was broken up and I saw that my righteousness would not save me. Cole describes himself as one who, until this time, was an Arminian and "intended to be saved by his own works." After hearing Whitefield, however, he came under a severe sense of sin which continued for two years and then issued in a glorious conversion. He left the Old Light church and became an active worker in a New Light congregation which was formed at Middletown. Cole has given us insight into the manner in which Whitefield’s immense congregations gathered upon such short notice in the sparsely populated areas of America. The Spiritual Travels of Nathan Cole. This is taken from Cole's original draft of the narrative, the ms. of which is in the possession of the Connecticut Historical Society. There is also a copyist's version which is edited and corrected as to spelling and grammar, but which lacks the quaintness of the original. Cole's Spiritual Travels and particularly this experience are discussed by Leonard W. Larabee in the William and Mary Quarterly, 3rd Series, VII, 1950, pp 589-90.